5100 bilstein shocks 2007 tundra, outside tire wear? Go to the tundra HQ...they have really good article. Steel, no plastic for sure. T you will have to add a block. I can show you on mine at feb meet. Shawn - can I add a leaf? Sometimes it doesn't seem as noticeable and doesn't bug me that I have to do it right away or at all. WELL guys went to a shop in DEER PARK AND THEY REALIGNED MY TRUCK TODAY WITH THE CAMBER set to 0.03 and -0.03 degrees. My before camber was .55 and .7 degrees. Guy new what problem was with outside tire wear. He said some of my adjustments are maxed out, anyone else hear this during level/lift alignment? 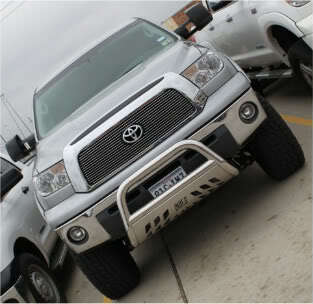 There was a young guy there after me with a over 6 inch Lift waiting his turn, they do quite a few lifted trucks. I'll see how it goes. He did not tell me which ones, but it drifts to right a little. JUST A BIG QUESTION TO EVERYONE. What kind of tire wear are ya'll getting with level kit, stock UCA after lets say 8-10,000 miles? If it is even wear, tell me your alignment values and were they able to align it within spec? MY ALIGNMENT was at .5 camber both sides after lift and alignment and still wearing more on outside . Went to NTB 3 TIMES AND THEY COULD NOT OR WOULD NOT put it to 0 camber. Went to other guy who does lifted trucks, paid 79 bucks and put it to 0 camber, .1 toe and 2.4 caster aprox. both sides. SPEC. NUMBERS WORK WELL WITH NOT LIFTED TRUCKS but they don't know what to do with lifted ones to reduce tire wear unless they understand the geometry of needing negative camber. AS a side note my before camber was -.4 to -.2 both sides with even wear without lift. With a level kit if they can get you to -.25 camber which is what they were shooting for, tell me cause my alignment adjustments are maxed out just to get it to 0 camber. I think that with a 3/1, 2.5 level lift outside tire wear is common and that is not good. Tires that should last 40-50,000 will last 1/2 that. unless you get U.C.A. (as other member had stated) and can get to some negative camber, this will be an issue I think. Knowing this I would have stayed stock do to not wanting to go with UCA and so on. FUTURE LEVEL KIT INSTALLERS be prepared for tire wear UNLESS you can get negative camber. AS it stands for me if 0 camber continues wear, I will pay to drop height of BILSTEINS to there lowest .85 inch and call it leson learned through experience. Idk, I've seen alot of people w/ level lifts that have fairly normal tire wear. I'll give it some more time with present alignment numbers and see how it goes. Subject: Re: 5100 bilstein shocks 2007 tundra, outside tire wear?